An American favorite, the Toyota Tundra offers hardworking power, rugged dependability and a family-ready cabin, so you can take your loved ones and furry friends out to the country with a boat or trailer in tow. This year, the truck delivers added value and appeal with an exterior refresh, cabin updates, an all-new 1794 Edition model and the new Entune App Suite. Test drive the 2014 Toyota Tundra in Evansville, IN today and learn more about this year's changes. The new 2014 Tundra is on sale now in SR, SR5, Limited, Platinum and western-styled 1794 Edition trim levels. Numerous configuration options allow for a wide range of possibilities when it comes to how you want to layout your truck. For example, along with having several trims to choose from, there are also three cargo bed lengths, two wheelbase options and three body styles, including a Crew Cab, Double Cab and Regular Cab. No matter your cargo storing needs or seating preferences, there is a Tundra that will meet your demands. On the outside, the pickup shows off more muscular definition, while the interior has a more refined presence and now features a new Entune system with apps such as Pandora, Yelp, Bing, MovieTickets.com and OpenTable. Along with the app suite, Entune offers real-time traffic and weather, so you'll always know what to expect on the road before heading out on a trip or to work. Also this year, Bluetooth and a rearview camera now come standard on every model across the lineup. With capable V-6 and V-8 engines, smart next-generation features and rugged style, the Tundra stands out among the crowd of full-size pickup trucks. It also offers Toyota reliability and has won several J.D. Power Vehicle Dependability Study awards. 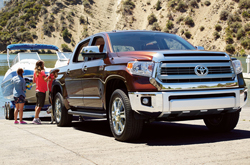 Shoppers in Indiana can find the 2014 Toyota Tundra for sale in Evansville now! Schedule a test drive with Kenny Kent today by filling out our online contact form. To see video of the truck's new styling and cabin updates, please scroll down to the bottom of our 2014 Toyota Tundra review. We're condifent that the Tundra is the best match for you. 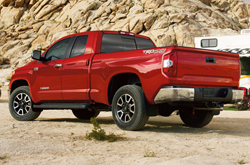 That's why we dare you to compare Toyota's most current model side-by-side with the 2014 GMC Sierra, Dodge Ram, Ford F 150 and the Chevrolet Silverado. The Tundra's got several noteworthy attributes, including its progressive onboard technologies and tasteful styling. When comparing its price to the opposition you will surely see that Evansville Toyota customers select it because it's a remarkable value. Find out more details in our bullet list below this text! 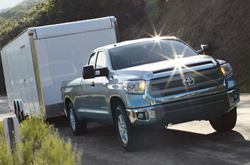 For reviews of the 2014 Toyota Tundra and older models, Kenny Kent Toyota is your trusted resource. Our reviews are recorded by veteran automotive writers - it's just another resource we provide as a leading Evansville area Toyota dealer. Information you can depend on to make intelligent decisions is right here - each article is brimming with accessible information and specs. Not sure if the Tundra is made for you? Check out our online research gallery to read more Toyota reviews and to compare Kenny Kent Toyota's models to vehicles from other manufacturers.